Many winters ago, I was holidaying at Blackheath, in the Blue Mountains west of Sydney. One morning just before sunrise I went for a walk along the quiet streets of this small village. The deciduous trees were bare against the clear blue sky and the air was particularly chilly. As I rounded a corner I noticed a heap of autumn leaves laying in the grassy gutter. The leaves were colourful enough, but what really caught my attention was the way the overnight frost had dusted the leaves with tiny white crystals. I remember picking up one of these leaves and slowly rotating it in my fingers as the sun’s first rays side-lit this delicate frosting. Years later, in 2003, I was living permanently in the Blue Mountains. 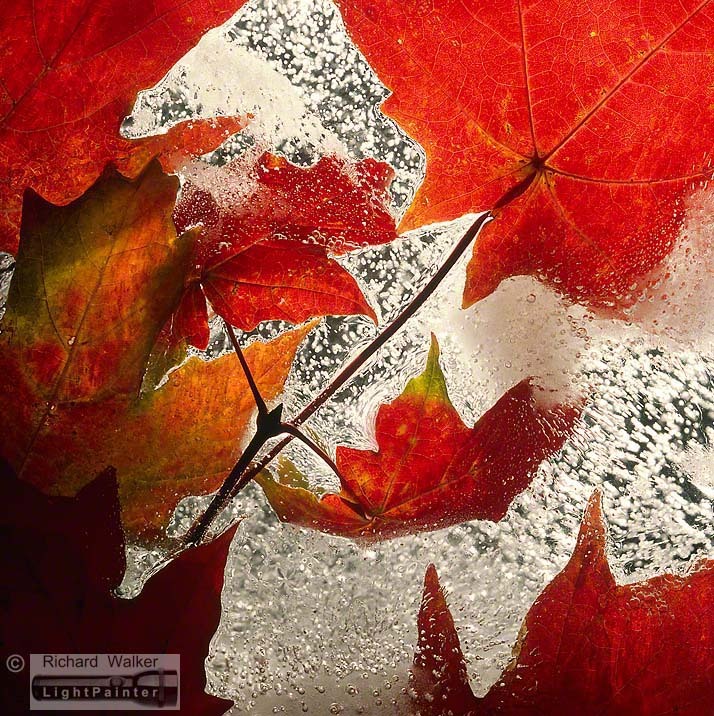 Autumn arrived and in my head I began to revisit this memory of frost-tinged leaves. 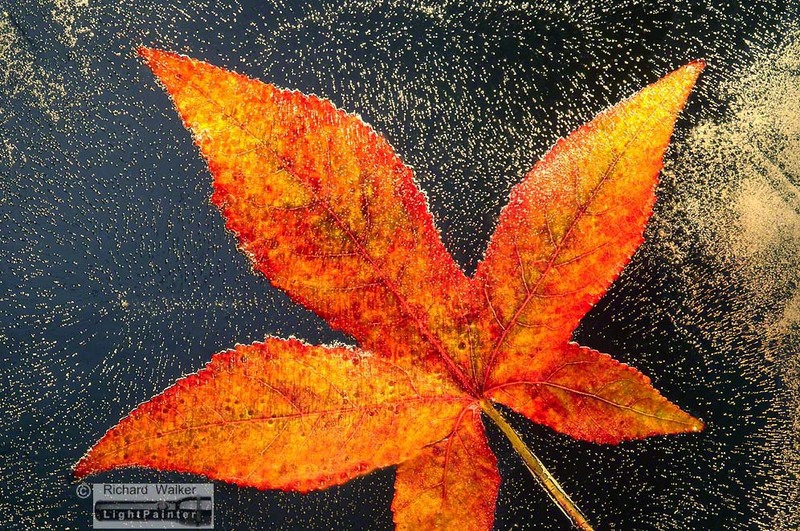 I decided to recreate this effect by freezing autumn leaves I had collected, then photographing the result in my studio using the Hosemaster lighting system. My experiment was a disaster. 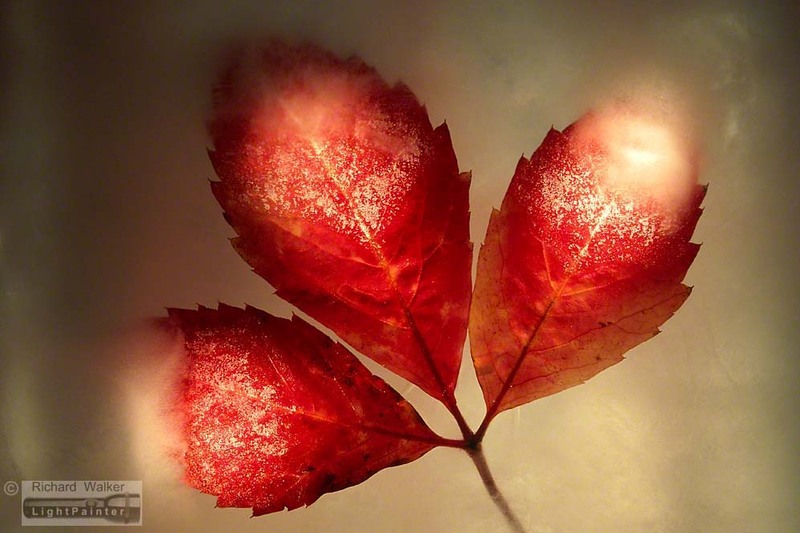 I had naively thought that spreading leaves on a baking tray and placing the tray in the freezer of my fridge would give me beautifully frosted leaves. 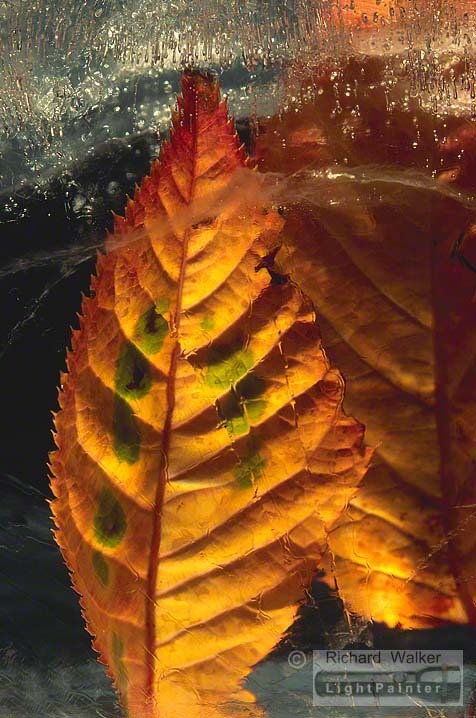 Instead, the sudden cold shrivelled the leaves and turned them black. Not a good look! 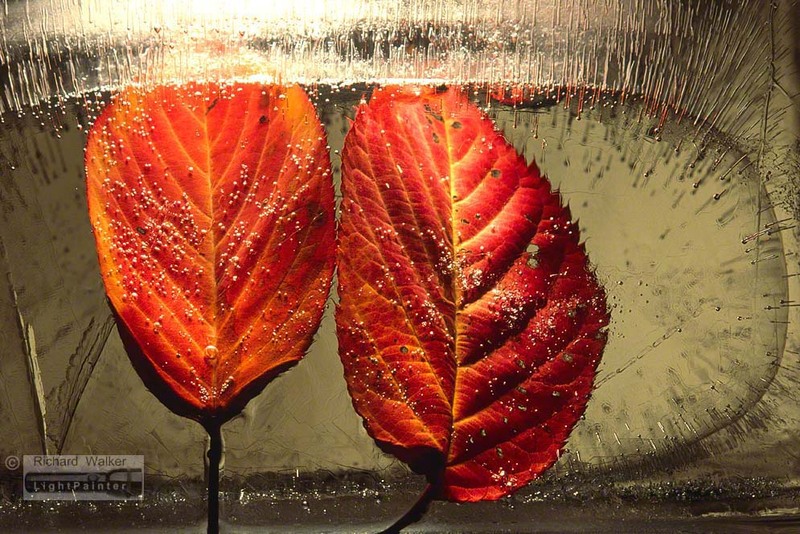 I wondered if I could protect the leaves by immersing them in a container of water and then freezing the container. Here is the result. Freezing water is simple, if you want to make ice cubes. But ice cubes are opaque — a white mass that is difficult to light and impossible to see through. 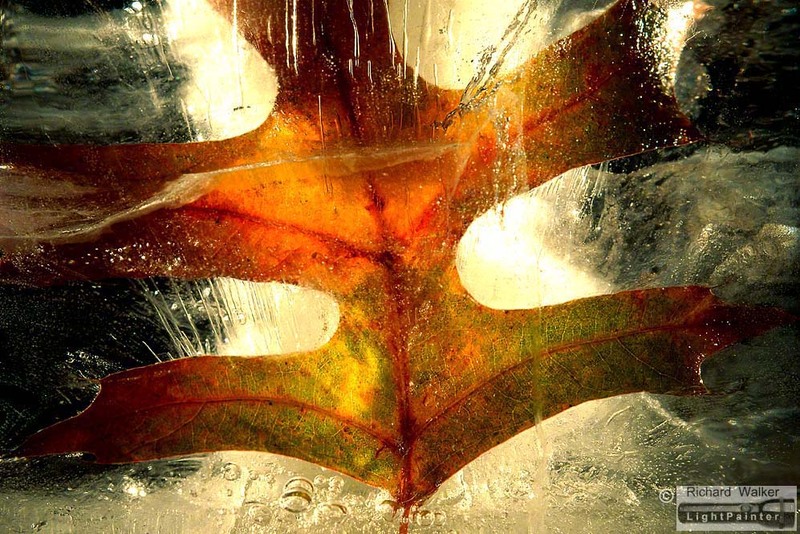 I discovered that if I wanted to see leaves trapped within the ice then some careful planning was required. Essentially I had to stop the freezing process when all the edges were solid, but the centre was not. The time required to reach this optimal transparency depended on the amount of water in the container and the physical shape of the container that was being frozen — a wide shallow dish of water froze in less time than a large deep tub. And because I needed to stop the freeze at a crucial point, I also needed to be absolutely set up in the studio, ready to shoot. It was an interesting waiting game. If you have ever tried to retrieve a wayward ice cube on a smooth surface, you’ll understand the difficulty I had trying to stop my precious ice blocks from moving while I photographed them. As these ice blocks melted on my studio bench, they floated on a thin film of water. So holding the blocks still for a macro shoot was quite a challenge. In the end, I devised a lasso of rubber tubing that surrounded the base of the block and fixed it on the shooting surface (often perspex, so I could light the ice from underneath). Anchoring an ice block for a short, single exposure seems simple enough. However this shoot was more difficult because the Hosemaster lighting system I used enabled me to light the ice from different angles by shooting multiple time exposures on the same frame of film. Each of these exposures were up to 30 seconds long, so an ice block could not move a millimetre for perhaps two minutes! Having a naturally cold studio slowed the ice melt but each exposure was essentially a race against time. In my final edit, I chose twelve images. Most were shot on 35mm, some on 120 film. I used Fujifilm Velvia and Provia stock. 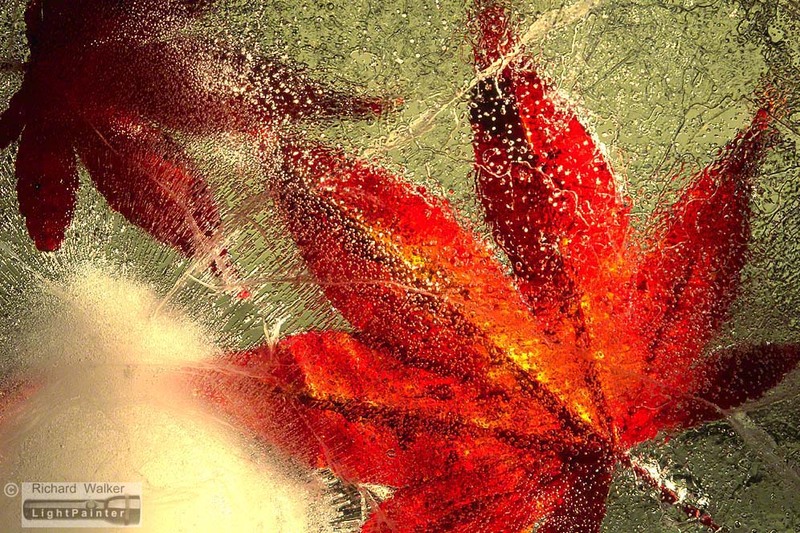 I love the richness of the autumn colours and the random nature of the captured air bubbles. 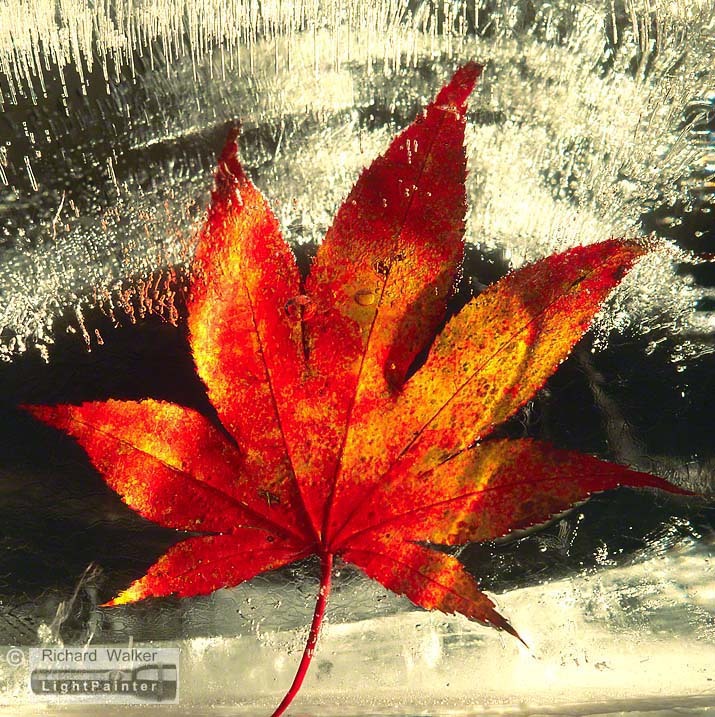 In some images the leaves seem to emerge from the ice. 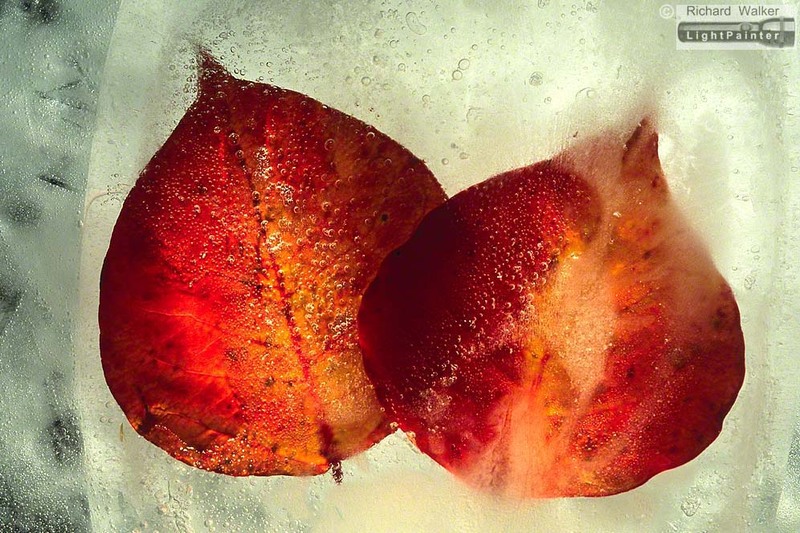 In other frames, the leaves appear to stand proud with all the drama of the ice behind them. These images are available as open edition, archival prints (see the menu heading — Prints). 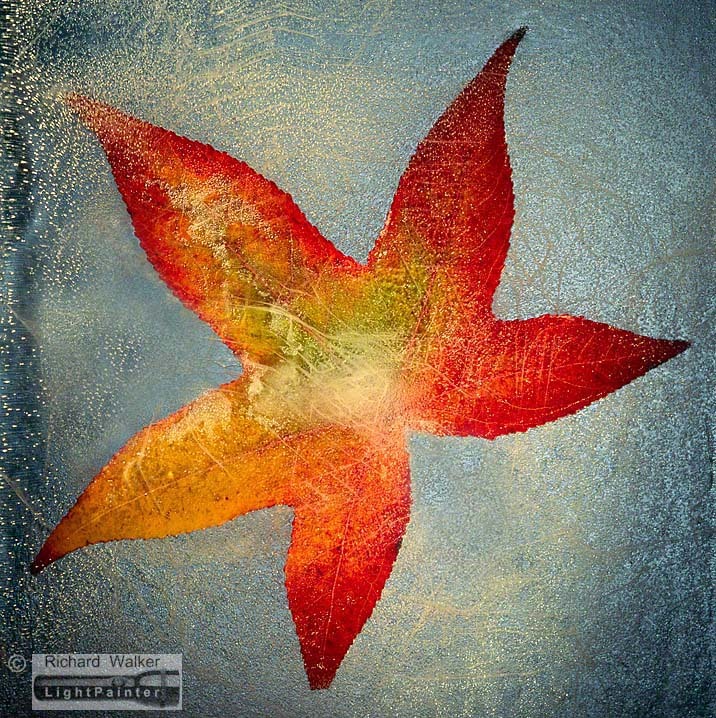 My watermark does not appear on purchased prints. Each print is signed by me but not numbered. Prints #1 to #9 measure 36cm x 24cm (14in x 9in). Prints #10 to #12 measure 24cm x 24cm (9in x 9in). For display purposes, I have seen these prints framed and hanging side by side in sets of two or three, but they work just as well when hung singly. 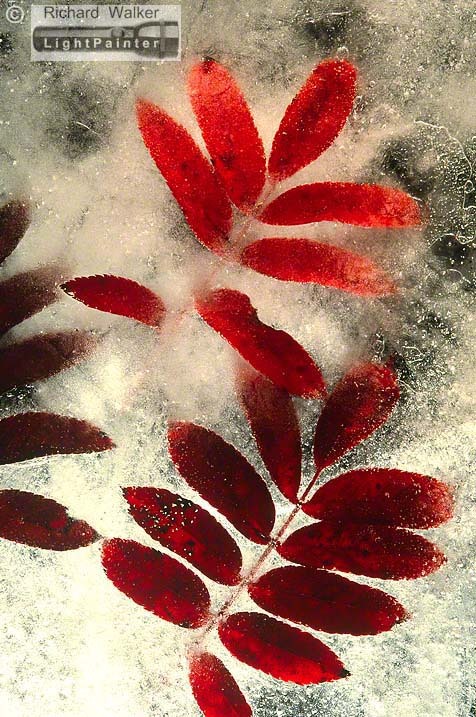 The iced leaves are splendid. An odd idea that works. I have always said the true art is distortion and this proves it. 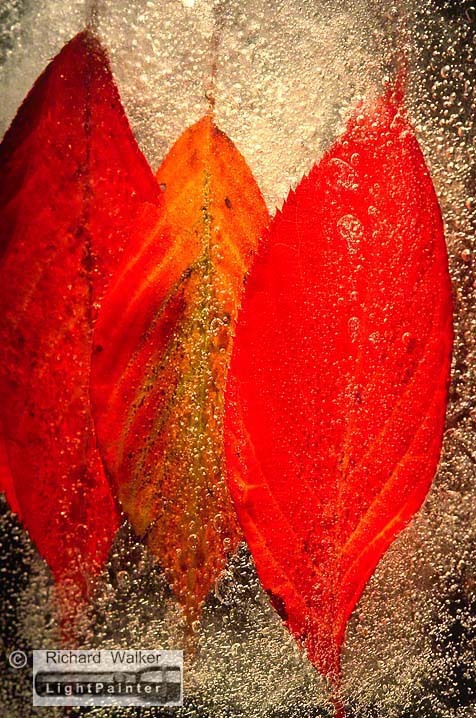 I have some liquid amber trees in the bush, with leaves ranging breathtakingly from black to outrageous fire tones. I will bring you a boxful next autumn. Remind me. Thank you John, for taking the time to view and comment on my work. I like these, especially the closeness in 6, 9 and the dimension in 11, 12. It’s a very unique group and super nice film results. This is a interesting series. A creative way to make use of the Hosemaster and not Photoshop.